I've become quite well acquainted with Martha Stewart...Martha Stewart paint, that is! I love Martha's paint colors, but, unfortunately, Martha's paint won't be around for long. According to our sources, Home Depot is phasing it out soon. I wish I had a lovely photo to show our version of gray cabinetry here at Love and Life at Leadora, but you'll have to stay tuned! Also, the apron sink is in, the countertops are being installed Thursday, and the new light fixtures are on their way! I am so excited! I'm on pins and needles!!! Can't wait to see more! we gor an update from your mom when we visited her last week. sounds like you have a large project you're working on. I'm itching to paint again.... probably need to do that when I retire, so I don't get grouchy or expect John to help! he's got enough on his plate with teaching college courses & fulfilling a full-time contract with SLOCOE. Can't wait to see the finished product! I know it will be gorgeous! Hi Heather! I'm really anxious to see your kitchen makeover. Martha's paint is frustrating because stores keep phasing it out. First Menard's had it and then it was gone. Then Lowe's had it and now it's gone. And now you say Home Depot is phasing it out. Ugh! I love her paint colors but it seems each time the paint goes to a different store, the colors change as well. I am intrigued how your kitchen will turn out! I thought gray is a dull color for kitchen but it really looks very nice and has a modern touch! I like it! I wonder why are they phasing out Martha Stewart's paint? hmmm..
Heather - I am so excited for you! I can't wait to see how it turns out! 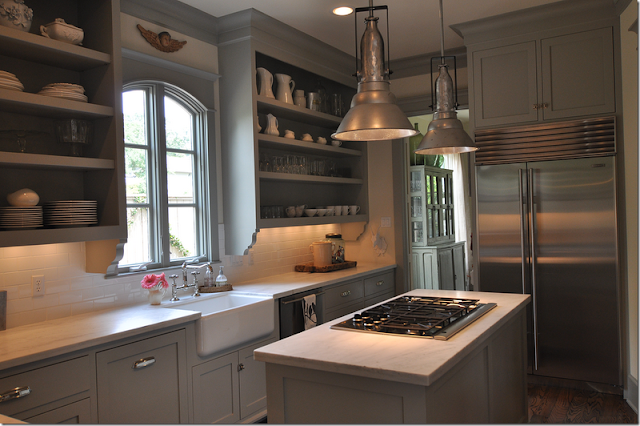 I always love kitchens with gray cabinets and it sounds like your will be beautiful! Great way to start off the New Year! Can't wait to see the finished product Heather! I love Sharkey Gray. I painted it on the inside of a hutch and have been trying to find something else to paint with it. I can't wait to see how the cabinets turn out. Sounds like a fun project for the winter time. these are NICE kitchens. Grey is fabulous. I am waiting to see the result... I am sure it will be nice! Yay! Sounds like your kitchen is coming right along. I'm so anxious to see it. It is sure to be beautiful! I loved both of those photos. I can't wait to see your kitchen! I love apron sinks and would love to have one here. OOH! Those look beautiful! Can't wait to see yours! It will look amazing! Things are progressing nicely. I look forward to the reveal. Hugs! Love these wonderful 'greys' to bad that they won't be available for long. I am so excited to see the stove and the countertops. I noticed the white tile backsplashes in the pictures you posted. Looks great! Oh, I can't wait to see it! Kitchen renovations are certainly not for the faint of heart and most definitely a labor of love. Have a great week and best wishes on the kitchen...Love the colors of grey! My mom more upset about it then you that they don't have her paint anymore for purchase. She has loyal fans.